Summary. The fixed small thoracic vertebra dislocation has been modeled on animals (rabbits) to simulate the biomechanics changes revealed on X-ray images (illustrated) in patients with thoracic zygapophyseal joints arthralgia. Involved spinal motional unit’s tissues were investigated by light microscopy after 7 and 14 days. The most reactive tissue was the fold of a capsule’s synovial membrane inside zigoapophyseal joint. Densely innervated by myelinated and unmyelinated nerve fibers synovial fold has been enlarged in average more than double as a result of edema and it was pinched closely between zygapophyseal facets. The intact synovial fold is presented for comparison. 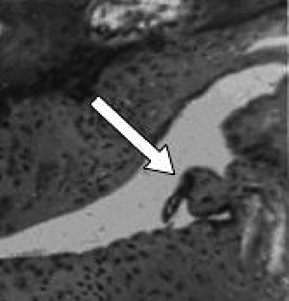 Specific changes of neural cell’s pools in substantia gelatinosa of Rolando and cells in lateral horn (sympathetic neural centers) of spinal cord gray matter were arose simultaneously on the level corresponded to displaced zygapophysal joints. Described mechanism triggers nociceptive afferentation from a swollen and squeezed synovial fold receptors with the facet pain syndrome of biomechanics nature. Facet syndrome (FS) with back pain has been discussed more than 100 years (Goldwaith J.E., 1911; Giles I.G.F., Taylor J.R., 1987) and described as a chronic lumbar spinal pain caused by pathologies of a zygapophyseal joints (Baster T., 2012). FS is considered as a result of numerous potential causes of pain: the age-related degenerative impairment of intervertebral disc, spondyloarthrosis, muscle- or ligament-related injuries etc. (Cohen S.P., Raja S.N., 2007). However, the processes within the specific anatomical structures of Z-joints, which produce the irritation of pain afferents signaling with FS of biomechanics nature have not been enough illustrated to date. We have not found convin­cing study results concerning mechanisms of pain involved in FS on the thoracic level in spite of certain attempts to solve the problem and related intensive discussing (Baster T., 2012). There is a set of nonsurgical effective approaches in FS treatment including the local medicine blockades (Manchikanti L. et al., 2012), exposure to extreme low temperature (cryoablation), high temperature radiofrequency and chemical neurolysis, radio-­frequency ablation (Soloman M. et al., 2010). The basic point of action of the methods mentioned above is a facet denervation — to affect nerves supplying periarticular and articular tissues. So, this is an evidence for the nociceptive afferentation from zygapo­physeal joints. However, these facts do not explain, which exact anatomical structures are responsible for the irritation of the pain afferents. Analysis of the thoracic X-ray images in 340 patients with nonspecific middle back pain have showed that biomechanical deviations in spinal unit were more frequent than degenerative disorders: 59.06% and 40.94%, respectively (Gongalsky V.V., 1994; 2014). This study did not involve the patients with any inflammatory signs of spondyloarthritis or spondylitis; inclusive criteria suggested negative inflammatory tests (rheumatic tests, inflammation blood and urine markers). The herniation of the thoracic disc, spinal stenosis, any sort of malformations, osteoporosis, neoplastic processes, wedge-shaped deformation of the vertebrae, vertebrae or ribs fractures and any other kind of pathology which could be cause of spinal pain were excluded. Polyradicular and pyramidal neurological signs were not present in studied patients. The study has shown (Gongalsky V.V., 1994; 2014) that involved functional spinal unit (FSU), verified clinically as a «painful», had common specific biomechanical characteristics in most cases: asymmetry of the intervertebral gap; slight lateral displacement of the vertebra; sign of lateral deviation of the spinous process (Fig. 1). Combination of these three revealed shifts in FSU was considered as a minimal fixed rotational displacement of the thoracic vertebra with a within the range than slightly exceeded physiological limits. The objective of the study was to verify exact structures in thoracic zygapophysal joints, which can source of nociceptive afferentatin in a pain FS of biomechanics nature. 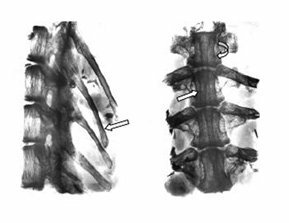 The fixed small rotational displacement of the vertebra, which had been revealed with radiographic examinations of patients with nonspecific thoracic back pain was modelled on rabbit thoracic spine (Fig. 2) (Gongalsky V.V., Tulinova E.V., 1987). Protocol of the experimental study was approved by the institutional Animal Care Ethic Committee of National Medical University named after O.O. Bohomolets. The total of 42 rabbits (Chinchilla breed) were involved in experiment. 35 rabbits were randomly divided into 7 experimental groups with 5 rabbits for each one. 7 animals served as control group (1 animal for each experimental group). The strictly unified metho­dological conditions for rabbits were provided: the same ancestry line, age (4–5 months old) and weight (2.5–3.0 kg). Animals were kept in identical conditions before and after surgical procedure. The minor operation was carried out under the total intravenous anesthesia using the anaesthetic agents: ketamine 2.0 mg/kg, diazepam 0.5 mg/kg and droperidol 1.0 mg/kg. Duration of surgical procedure was not traumatical and did not exceed 12 minutes: the apexes of the second and third thoracic spinous processes were denudate surgically by small section over them. The modeling of rotational displacement of the vertebra was performed by a dosed mo­ving of the ThІІІ spinous process to the left and we approached it down to the ThІV spinous process. Both spinous processes (ThІІІ and ThІV) were tied together by ligature. A wound was sutured in layers. Animals were taken out from experiments on 7, 14, 28, 42, 56, 84 and 168 days (7 groups) with using intravenous injection of thiopental sodium (2 ml of 10% solution) into the lateral vein of the rabbit ear. Parts of the spine (TI–TV) with adjoining tissues were cut out and placed in to 10% formalin for 3 days. Decalcification was performed in 5% nitric acid in formalin, then in spirits of growing concentrations, further — in 96° ethyl alcohol and ether mixture (1:1). After that, they were passed through celloidin of different density and filled up in slabs. The ladder-shaped slices of 7–10 microns section thickness were made on sledge microtome and imbued by hematoxylin and eosine. Slices were desiccated by 96° ethyl alcohol, cleaned by xylol and put into balsam. The light microscopy was performed under 10th objectives and 3.9th ocular. Spinal cord segments corresponded to the level of displaced vertebra were studied to investigate neurons in the different Rexed’s laminas. To confirm a pain afferentation including its autonomic component in FS, the neurons in the gelatinous substance of Rolando in posterior horn as well as neurons of the lateral horn of spinal cord gray material were examined. The results after on 7 day of experiment (acute stage of back pain) have been described in the article. The image correspon­ded to subacute stage of pain on 14th day of experiment has been presented for comparison. The most significant changes in dislocated thoracic FSU tissues have been detected in zygapophyseal joints. The marked edema of the synovial fold and wedging it tightly between zygapophysial facets were discovered after 7 days of forming fixed rotational vertebral displacement in FSU (Fig. 3). 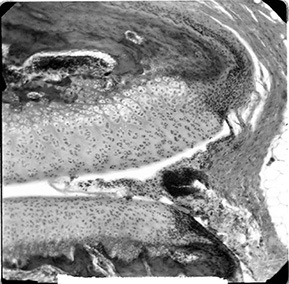 Microimage of rabbit spine on the 7th day of TІІІ rotational displacement vertebra mode­ling. Slight subluxation of the zygapophyseal articular processes with intact cartilage: (2) and (3). The edematous fold of synovial membrane (1) and closely wedging it between zygapophyseal articular processes can be seen. Changes in acute stage of FS is shown on Fig. 4. The intact synovial fold is presented for comparison. Microimage of rabbit spine of the control group. No vertebral subluxation has been revealed. On the left photo intact synovial fold is marked with arrow. Digits 1 and 2 indicate zygapophyseal joint processes with intact cartilage. On the right photo detailed enlarged part of the intact synovial fold is shown (marked with arrow). On the 14th day of the experiment the synovial fold was still edematous and enlarged but less tightly wedged between zygapophysial articular processes (Fig. 5). Morphological picture corresponds to subacute stage of FS. This is a microphotography of rabbit’s spine. 14 days after forming displacement of the third vertebra. Minimal displacement of zigapophysial articular processes is visible. The synovial fold is edematous, but less enlarged and less tightly wedged between the zygapophysial articular processes. This is a picture of the facet syndrome in subacute stage. Described inflammatory changes of the synovia fold were regressing gradually even in maintained subluxation. The histological signs of another different causes of spinal pain had been occurring gradually up to 168th day of the study (approximately within 6 months), forming some different chronic causes of spinal pain. Biomechanics of a thoracic spine is ra­ther complicated. There are some basic movements in a thoracic FSU: flexion and extension in a sagittal plane, rotation in a horizontal plain and a slight tilt in a frontal plain. These movements are proceeding simultaneously to provide physiological mobility in thoracic FSU. Physiological ranges of movements in each thoracic FSU are minimal. The required mobi­lity of the entire thoracic spine is provided by the sum of numerous independent small movements of each FSU. Described movements are physiological, painless and not traumatic. Analysis of spinal areas on the level of dorsalgia by X-ray images assessment has shown the common specific biomechanical deviations in FSU which were detected more often than degenerative abnormalities (Gongalsky V.V., 2014). The most important of them were the slight lateral displacement of a vertebra and lateral deviation of the spinous process. The phenomenon of lateral deviation of the spinous process has been discussed in terms of should it be considered as a sign of pathology or not. It may really be an innate curvature of the process. But, dislocated spinous process as a sign of FSU pathology has been described and even declaratively patented (Suvak V.V., 1982). According to our investigations (Gongalsky V.V., 1994; 2014), the deviation of the spinous process becomes clinically significant in case of a vertebra rotation in a range extended a little more than physiological (Gongalsky V.V., 2014). This deviation accompanied by specific clinical signs: rotated apex of the spinous process was a locally painful in palpation as well as painful regions over zygapophysial joints in paravertebral zones. It is important to notice that the dege­nerative signs were presented not only in affected FSU but also in intact («painless») spinal segments to the same extent. Modelling of the rotational thoracic vertebra displacement on a human spine specimen without soft tissues showed that the maxi­mal angle of rotation of the thoracic vertebra in horizontal plain was 5° (Gongalsky V.V., 1994). In case of intact soft tissues in FSU, the range of this motion was decreased substantially up to 2–3° (Gongalsky V.V., 1994). D.J. Maiman and F.A. Pintar (1992) described the maximal angle of the thoracic vertebra rotation as 9°. According to our research, the same angle of vertebra rotation is possible, but in case of exceeding rotation which is more than physiological. It is possible only with additional lateral tilt of a vertebra body coupled with its side small displacement. There are some available data (Maiman D.J., Pintar F.A., 1992) affirmed the side thoracic vertebra tilt. According to our data (Gongalsky V.V., 1994), separated side tilt in that range is not possible without accompanied extra rotation. This two biomechanics factors lead to asymmetry of intervertebral gap (the second X-ray sign). 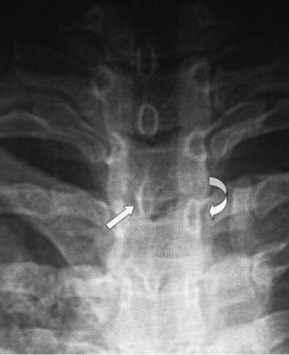 The third sign is a local asymmetrical banding in a spinal unit (Gongalsky V.V., 2014). The total sum of described movements provides the thoracic vertebra extra rotation. So, this kind of a thoracic vertebra extra rotation detected on frontal X-ray images has integrated sign — small extra deviation of spinous process. Extra deviation of a spinous process can differ in its range. It is possible to locate it, for example, in a top or in a beginning of scoliotic arc. Solitary vertebra displacement may happen during overload of a spine: in lifting of heaviness, during awkward movement or in staying in uncomfortable posture. In any case, the side deviation of spinous process coupled with painful areas and mentioned X-ray signs indicate FSU instability with biomechanical reaction of zygapophyseal joints in the form of asymmetry facets dislocation. The fold of a synovial membrane is located in joints cavity and does not prevent movements of joint in physiological range. But, in over-dislocation of facets, the synovial fold reacts rapidly with edema. Inflammated synovial fold becomes nonflexible body. It gets wedged between joint facets and prevents further joint motion. Thus, it’s possible to assume that rapid enlargement of synovial fold is a protective reaction aimed to prevent mechanically further facets motion and more serious trauma. 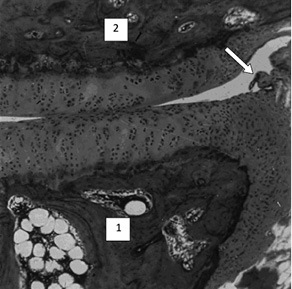 Synovial membrane is abundantly innervated by thinly myelinated and unmyelinated nerves trunks (Wyke B., 1972) and endings around vascular plexuses (Mapp P.I., 1995). The most significant are the articular receptors of IV Type category embraces the non-capsular nerve endings in joint tissues, being represented by lattice-like plexus and free nerve endings. IV Type plexus system is a distinctive neural representative for fibrous tissue of zigapo­physeal capsule. Plexus nociceptively informs us about deformation or stretching of the capsule together with the III Type very slowly adapting endings in ligament attachments to a bone. All capsule receptors and intra-capsule nerves are anatomically connected with vessels (Wyke B., 1972) and should respond to inflammation of the capsule synovial membrane in over-stretching and capsular tissue inflammation. This is the most possible reason of developing pathological nociceptive (pain) afferentation from receptors in swollen synovia fold. The evidence of pain afference has been expressed with specific neural cells reaction in substantia gelatinosa of Rolando (Gon­galsky V.V., 1994) and in lateral horn (Gon­gal’skii V.V., Kuftyreva T.P., 1992) of spinal cord gray matter on the level related to the FSU with dislocated vertebra. Substantia gelatinosa controls pain signaling (Petras J.M., 1968). The neural cells reaction in a lateral horn of medulla spinalis (sympathetic centers) is evidence of well known sympathetic tinge of vertebral pain. The cause of pain in FS of biomechanics nature is a trauma of zigapophyseal joint soft tissues in a small over-range motion of the facets and fixed them in dislocated position. Even small trauma resulted from an awkward body movement or being in uncomfortable posture may produce the same over-dislocation in FSU where zigapophyseal joint fold of synovial membrane responds first. Synovial membrane of thoracic zigoapophyseal joints is a reactive tissue which is capable to enlarge immediately by inflammation in trauma even due to the small over-range movements of spinal motional unit. This is the one of compensatory mechanism to block a spinal unit for preventing further dislocation of the facets and more serious impairment. The synovial membrane is innervated by thinly myelinated and unmyelinated nerve fibers. This is the reason of arising nociceptive afferentation out of receptors from swollen and squeezed synovial fold. The painful spinous process is a result of irritated segmental neural fibers which supply zigapophyseal joints within one segmental sclerozone. 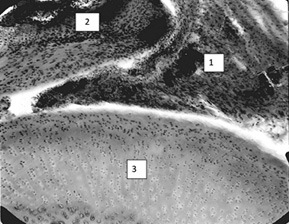 Specific changes of neural cells in substantia gelatinosa of Rolando and cells in lateral horn (sympathetic neural centers) of spinal cord gray matter arose on the level corresponded to the displaced zygapophyseal joints. This is an evidence for the pain afferentation in FS of biomechanical origin. Acknowledgement: I express my gratitude to histologists — N.F. Moroz, MD, ScD., and L.G. Goncharenko, MD, for assistance in preparation and assessment related to histological part of the investigation. Baster T. (2012) Are facet joints relevant? Int. Musc. Med., 34(1): 1–2. Cohen S.P., Raja S.N. (2007) Pathogenesis, diagnosis, and treatment of lumbar zygapophysial (facet) joint pain. Anesthesiology, 106(3): 591–614. Giles I.G.F., Taylor J.R. (1987) Human zygapophyseal joint capsule and synovial fold innervation., Br. J. Rheumatol., 26(2): 93–98. Goldthwaite J.E. (1911) The lumbosacral articulation. An explanation of many cases of «lumbago», «sciatica» and «paraplegia». Boston Med. Surg. J., 164: 365–372. Gongal’skii V.V., Kuftyreva T.P. (1992) Vascular and vegetative spinal cord disorders in disruptions of the mobile vertebra. Neurophysiology, 24(6): 444–448. Gongalsky V.V. (1994) Mechanisms of forming vertebroneurology manifestations in spinal unit functional block. 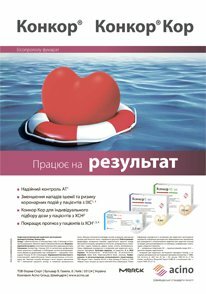 The Summary of the Dissertation for Doctor’s of Medicine Degree, Kiev, 35 p. (in Ukrainian). Gongalsky V.V. (2014) The role of biomechanics disorders in formation of pain syndrome in the thoracic spine region (dorsalgia). Ukr. Neurol. J., 1(30): 5–10. Gongalsky V.V., Tulinova E.V. (1987) The mode of modelling of osteochondrosis: certificate of recognition 1474721 USSR: КMI 09 В 23/28/ Кiev Medical Institute named after O.O. Bohomolets, № 4175516/28–14, declared 04.01.87; published 23.04.89, Bull., 15: 2 (in Russian). Maiman D.J., Pintar F.A. (1992) Anatomy and clinical biomechanics of thoracic spine. Clin. Neurosurg., 38: 296–324. Manchikanti L., Singh V., Falco F.J.E. et al. (2012) The role of thoracic medial branch blocks in managing chronic mid and upper back pain: a randomized, double-blind, active-control trial with a 2-year follow up. Anesthesiol. Res. Pract., 2012: 585–806. Mapp P.I. (1995) Innervation of the synovium. Ann. Rheum. Dis., 54(5): 398–403. Petras J.M. (1968) The substantia gelatinosa of Rolando. Experientia, 24(10): 1045–1047. Soloman M., Mekhail M., Mekhail N. (2010) Radiofrequency treatment in chronic pain. Expert Rev. Neurother., 10(3): 469–474. Suvak V.V. (1982) The diagnostic mode of the disk hernia level and form: Certificate of recognition 1055479 USSR: КМI А 61 В 10/00/ Кiev Medical Institute named after O.O. Bohomolets, № 3469576/28–13; declared 09.07.82; published 23.11.83., Bull., 43: 3 (in Russian). Wyke B. (1972) Articular neurology — a review. Physiotherapy, 58(3): 94–99. Резюме. На тваринах (кролях) змодельовано мінімальне фіксоване зміщення грудного хребця, що відтворювало біомеханічні зміни, виявлені на рентгенограмах у хворих на артралгію в ділянках грудних міжхребцевих суглобів (рентгенограма наведена). Досліджено тканини залученого рухового сегмента хребта через 7 та 14 днів. Найвищу реактивність виявлено в ділянці виросту синовіальної оболонки капсули міжхребцевого суглоба. Рясно іннервований безмієліновими та слабкомієлінізованими тонкими волокнами виріст синовії збільшувався більше ніж вдвічі внаслідок набряку і щільно вклинювався між робочими поверхнями суглоба (фасетками). Для порівняння наведено незмінений синовіальний виріст. Одночасно зафіксовано зміни в пулах нер­вових клітин желатинозної субстанції Роландо та бокових рогах (симпатичні центри) сірої речовини спинного мозку в сегментах, які відповідали дислокованим суглобам. Описаний механізм запускає ноцицептивну аферентацію з рецепторів набряклого і механічно ущільненого синовіального виросту при біомеханічно зумовленому больовому фасетковому синдромі. Ключові слова: фасетковий больовий синдром, міжхребцеві суглоби, синовіальна оболонка, виріст синовіальної оболонки капсули міжхребцевого суглоба, дорсалгія, ноцицептивна спінальна реакція. Резюме. На животных (кроликах) смоделировано минимальное фиксированное смещение грудного позвонка, которое повторило биомеханические изменения, выявленные на рентгенограммах у больных с артралгией в области грудных межпозвонковых суставов (рентгенограмма приведена). Изучены ткани вовлеченных позвоночных двигательных сегментов через 7 и 14 дней. Наиболее реактивным оказался вырост синовиальной оболочки капсулы межпозвонкового сустава. Обильно иннервированный безмиелиновыми и слабомиелинизированными тонкими нервными волокнами вырост синовии увеличивался в cреднем более чем вдвое вследствие отека и плотно вклинивался между суставными поверхностями (фасетками). Для сравнения приведен неизмененный синовиальный вырост. Одновременно зафиксированы изменения в пулах нервных клеток желатинозной субстанции Роландо и боковых рогах (симпатические центры) серого вещества спинного мозга в сегментах, которые соответствовали дислоцированным суставам. Описанный механизм запускает ноцицептивную афферентацию из рецепторов отекшего и механически ущемленного синовиального выроста при биомеханически обусловленном фасеточном болевом синдроме. Ключевые слова: фасеточный болевой синдром, межпозвонковые суставы, синовиальная оболочка, вырост синовиальной оболочки капсулы межпозвонкового сустава, дорсалгия, ноцицептивная спинальная реакция.